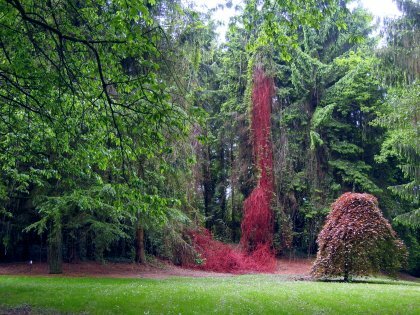 A red liquid seemed to have been shed in an isolated grove, leaving traces. The visual effect is expected to be unsettling or ambiguous : What happened there? How do we justify our presence within this fragile ecosystem? 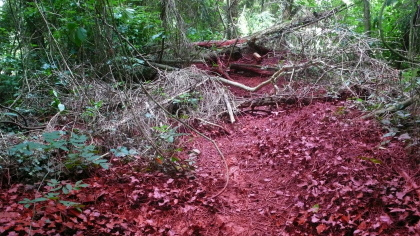 Infractions was in fact using a natural red paint (bone glue, earth pigments, linseed oil) . The paint was laid on the ground and on deadwood and was degrading within roughly 2 months under the influence of weather, mould and insects, vegetation eventually taking over. "To enter ot not to enter ? the wood or the work ? the work or the spirit of the work ? the spirit of the work or the spirit of the artist ? To enter into oneself as into Nature ?" Philippe HOORNAERT, curator of Couleurs³, the exhibition"